Two of the four undefeated Class 3A teams in the state will face off when the Nemaha Central Thunder travels to play the Silver Lake Eagles in the second round of the playoffs on Saturday. Nemaha Central topped Pleasant Ridge 61-6 in the first round. 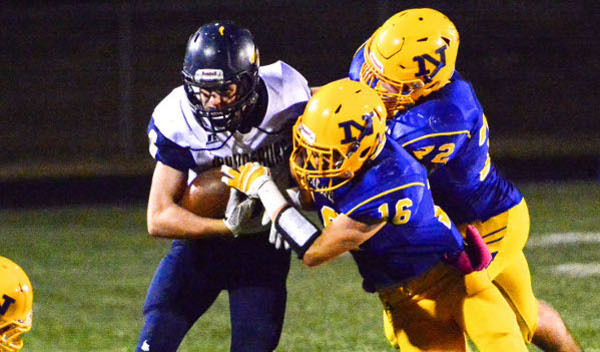 The Thunder boast some big-play performers in Jacob Koelzer and Mitchell Henry. Koelzer scored on a 90-yard touchdown run against Pleasant Ridge. Henry caught an 85-yard touchdown pass from Ryan Hasenkamp and returned a punt for a touchdown. Nemaha Central, which captured the Big 7 title, won its first 10 games last year before being eliminated by eventual state champion Rossville in the second round of the playoffs. Only two of Nemaha Central’s wins this season were against teams that finished the regular season with winning records. However, they were both big victories. The Thunder beat 4A Division II’s Holton 43-42 in Week 3 and handed Sabetha its only loss of the season 20-14 in Week 7. Coach Warren Seitz has led the Thunder to a 36-6 record over four seasons. Silver Lake coach C.J. Hamilton earned his 400th career victory when the Eagles topped Mission Valley 50-0. Eagles quarterback Dalton Dultmeier passed for four touchdowns during the win. On the season, Dultmeier has completed 104 of 175 passes for 1,888 yards with 18 touchdowns and only two interceptions. He also leads the Eagles with 580 rushing yards. Mason Jones has rushed for 520 yards, and Garrett Huske has rushed for 444 yards. Senior Ryan Wagner leads the Silver Lake receivers with 35 catches for 850 yards and eight touchdowns. Joshua Boyd leads the defense with 111 tackles. Keenan Baird and Trent Byers have five interceptions each. Silver Lake edged two-time defending state champion Rossville 36-28 in Week 5. Halstead has delivered another strong season after graduating standout running back Blake Beckett and quarterback Eli McKee. The Dragons were 10-3 and 12-1 the last two seasons. This year, Halstead just lost 34-6 to explosive Pratt in a road contest in Week 6. The Dragons won their district with a 71-8 home win against Sterling, and then bounced Southeast of Saline, 36-22, in the first round of the playoffs. Halstead had a key Week 2, 26-24 home win against Hesston, which is still alive in the 3A postseason. Halstead has an average score of 38-12. Last season, the Dragons’ average total was 40-9. Garden Plain’s average score is 36-18. Last season, the offense averaged 338 rushing yards a contest with both McKee and Beckett exceeding 1,200 rushing yards. But senior Layke Heimerman has stepped into a bigger role this fall. He had 789 rushing yards and 10 rushing scores and paced the team with 104 tackles as a junior. This year, Halstead rushes for 315 yards a contest. Heimerman has 126 carries for 946 yards and nine scores. Senior Tony Morris has 124 carries for 1,061 yards and 14 scores with seven 100-yard performances. Senior Chase Vansteenburg has played great in his first year as the starting quarterback. He has 120 carries for 912 yards and 19 rushing scores. Ninety-five percent of Halstead’s offensive plays come on the ground. Defensively, Heimerman has 70 more tackles than any other player with 132 stops. Halstead has averaged five TFLs per contest and has forced 21 turnovers. The Dragons have five non-offensive scores. Garden Plain has found ways to win. The Owls were outgained in Week 8 against Chaparral by 97 yards but won 22-14. Garden Plain opened the season with a 33-27 win against Hesston. The Owls are 4-1 in games decided by nine points or fewer this year. On Tuesday, Garden Plain held off Wichita Independent, 12-7. The Hesston meetings were similar for both teams. Garden Plain outgained Hesston, 465-446, and forced four turnovers and finished plus-2 in turnover margin. Halstead outgained Hesston, 363-332, and ran just three more plays. Senior Nate Pauly is the Owls’ do-everything player. He has completed 21 of 38 passes for 436 yards with four scores against three interceptions. He has rushed 144 times for 1,354 yards and 25 rushing scores. As well he has picked off five passes for a team that has forced 21 turnovers, and serves as the team’s primary returner. Since 2004, these teams have split six meetings, though Halstead has won the last two, 58-0 and 32-28. The 58-0 contest was one of the major turning points in the Halstead program moving into the elite. This one is close, but Halstead’s balanced backfield earns the win.